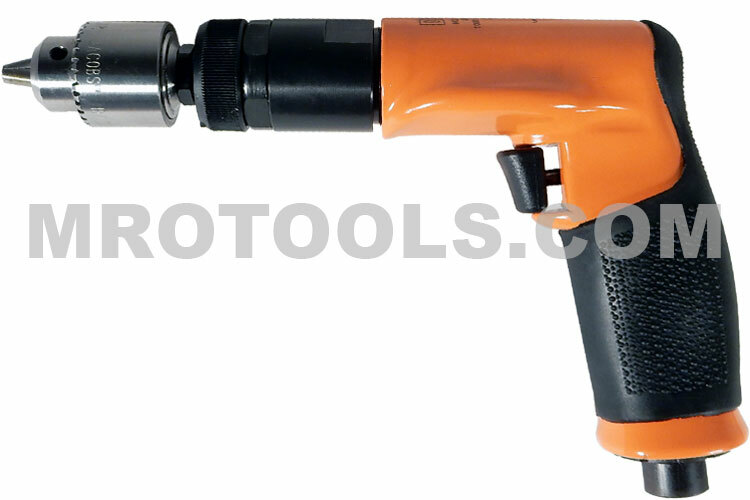 The 14CFS91-38 Dotco 14CF Series Pistol Grip Pneumatic Drill, Non-Reversible, 1/4'' Chuck is one of thousands of quality tooling products available from MRO Tools. Please browse Dotco 14CF Series Pistol Grip Pneumatic Drills, Non-Reversible for tools similar to the 14CFS91-38 Dotco 14CF Series Pistol Grip Pneumatic Drill, Non-Reversible, 1/4'' Chuck. 14CFS91-38 Dotco 14CF Series Pistol Grip Pneumatic Drill, Non-Reversible, 1/4'' Chuck description summary: Dotco 14CF Series Non-Reversible Pistol Grip Pneumatic Drill (Chuck Included). Termination: 1/4'' Chuck Free Speed (rpm): 5,200 Weight: 1.5lbs/0.68kg Overall Length: 5.7''/145mm Air Inlet Size: 1/4'' Quantity discounts may be available for the 14CFS91-38 Dotco 14CF Series Pistol Grip Pneumatic Drill, Non-Reversible, 1/4'' Chuck. Please contact MRO Tools for details.